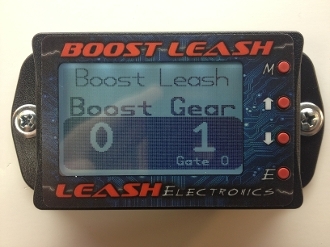 New gear based Boost Leash now available. Simple 4-5 wire hook-up. Ign voltage, ground, scramble ,clutch switch input and auxillary shift input(if motorcycle option is selected below). Controller can run on co2 or manifold pressure. Has a lunch psi setting, number of gears setting, and psi and rate for each gear. The way it works is when the clutch is held for more than 1 second it resets the gears to gear1 and puts the contoller in the launch mode. When the clutch is release the controller goes into gear 1 mode and each time the clutch is pressed it goes to the next gear until the final gear is reached. It only up shifts. It also has an optional shift input that can be connect to air shifter controllers to up shift with a air shifter setup on motorcycles if the motorcycle option is selected below. So to reset down to 1st gear you just hold the clutch for over 1 second and it goes back to gear 1. The controller also has automatic activation so that you dont need a seperate activation switch. When the controller senses more than 2psi boost then it becomes active and runs whatever is programmed. This controller is also perfect for turbo motorcycles!